Alexis Cohen, a former contestant on "American Idol," was killed after being struck by a car in New Jersey. The man believed to have been driving has been arrested. Cohen, 25, was found in the Seaside Heights at approximately 4 AM by two pedestrians who dialed 911. Daniel Bark, the 23-year-old believed to be driving the car that hit Alexis, was arrested on Sunday evening. He is being held in lieu of $35,000 bail, and is being charged with reckless driving and leaving the scene of an accident. "Idol" judge Paula Abdul tweeted about the tragedy, writing, "My heart goes out to the family of Alexis Cohen. She showed great courage at Idol and let's all send our prayers to her family now." Fellow judge Simon Cowell was also deeply upset by the news, commenting to "Extra" about Alexis' death. "I was incredibly sad to hear the news about Alexis. She was one of the contestants I will always remember. She had a big personality and a big heart. My thoughts are now with her family and friends." 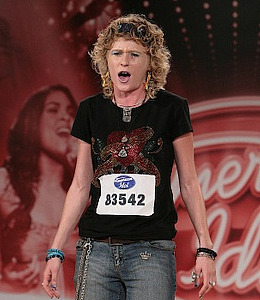 Alexis first auditioned for "Idol" during the seventh season, where she earned the nickname "Glitter Girl." Cohen later auditioned for season eight of the singing competition.